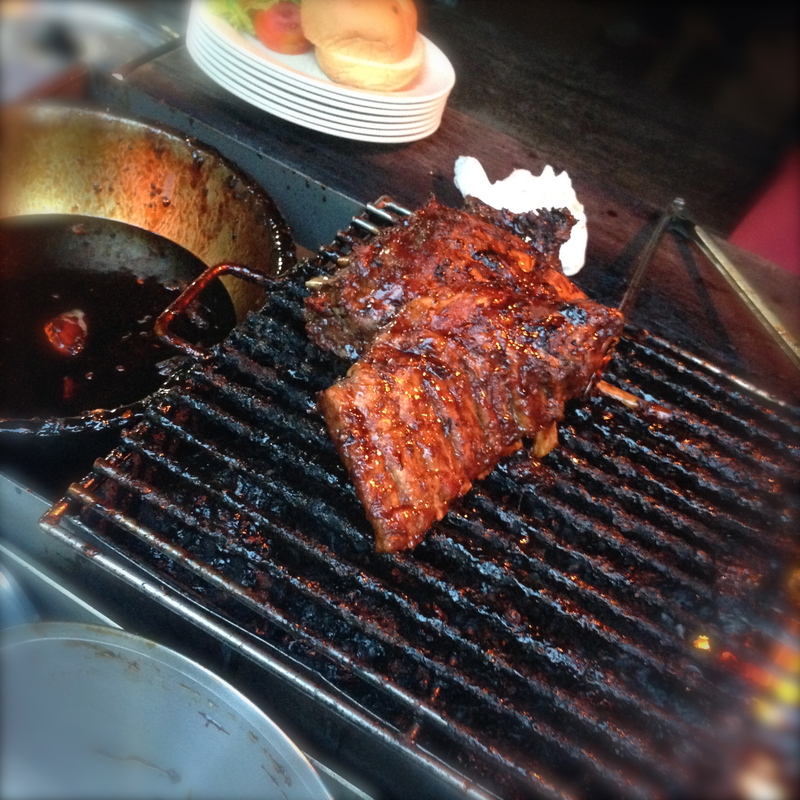 Barbecued ribs and martini appeal to you? 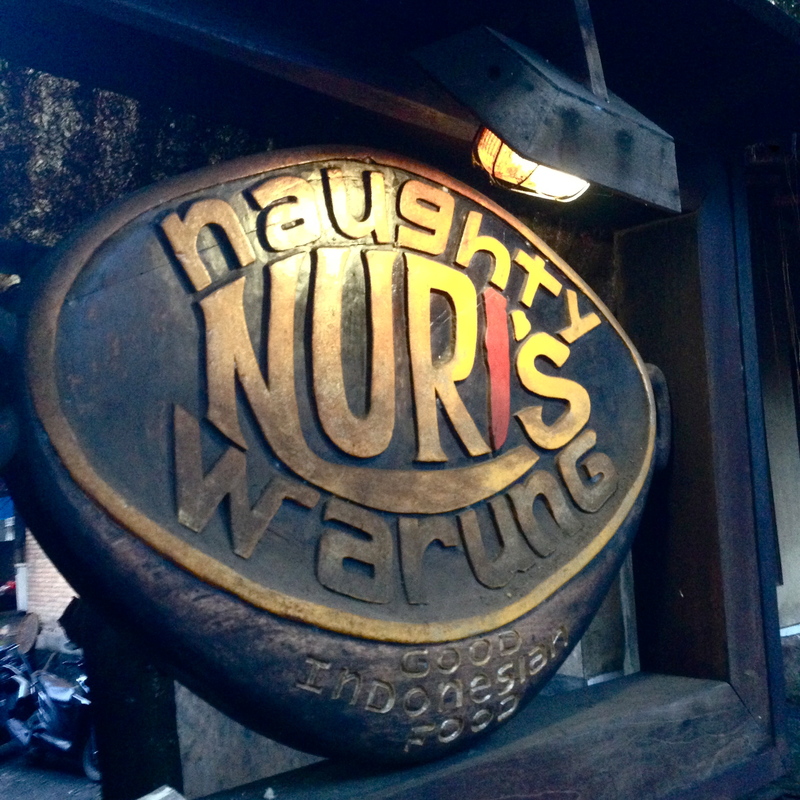 If you’re a self professed big foodie carnivore Naughty Nuri’s Warung is a must on the hit list, the warung specialises in tender, juicy, saucy, generous slabs of pork ribs you’ll be happy to eat it alone without any accompaniment, well that and maybe a refreshing blend of watermelon juice or a couple glasses of their signature martini guaranteed to pack a punch (the drink has Anthony Bourdain name dropping and ranting about, must do, no?). Don’t let the word martini catch you off guard, Naughty Nuri’s is a humble shack with not much changed since it opened up 20 years ago. 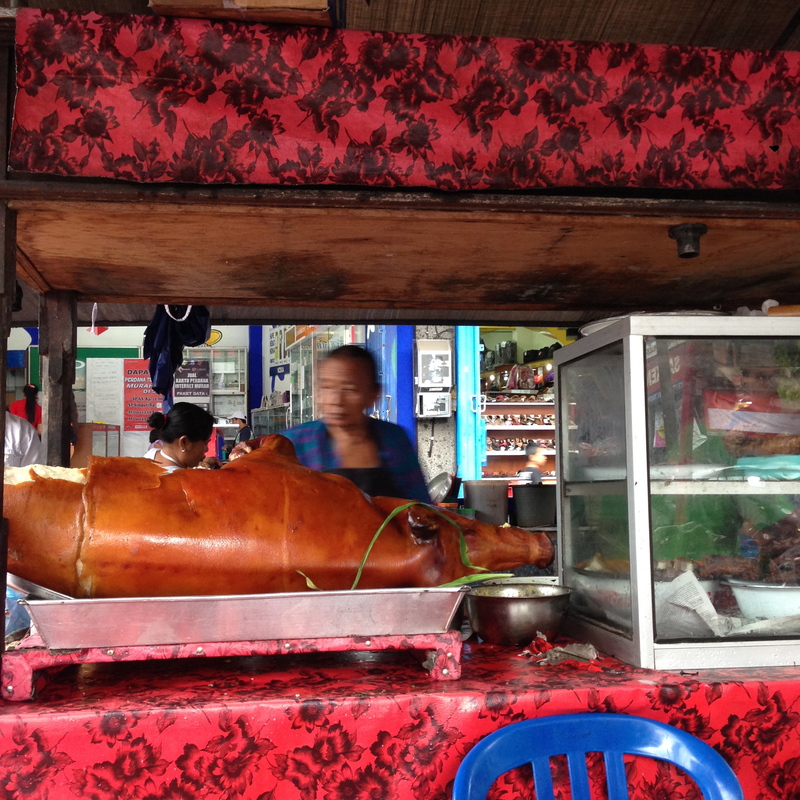 No frills, you sit down on a communal table, order from a sheet menu, then watch your ribs grilled in front of the restaurant sharing the pavement with pedestrians under trance as they catch a waft of the grilling. Now if traveling to Ubud is too much of a push for the duration of your stay don’t cry just yet, Naughty Nuri’s has branches scattered all over Bali and south east Asia. However you can’t beat ambiance of the original shack, try make it out and try knock two birds with one stone – it’s located conveniently opposite The Neka Museum on Jalan Raya Sanggingan, on the way down you probably do with a bit of happy waddle along the Campuhan Ridge. Quack for duck? 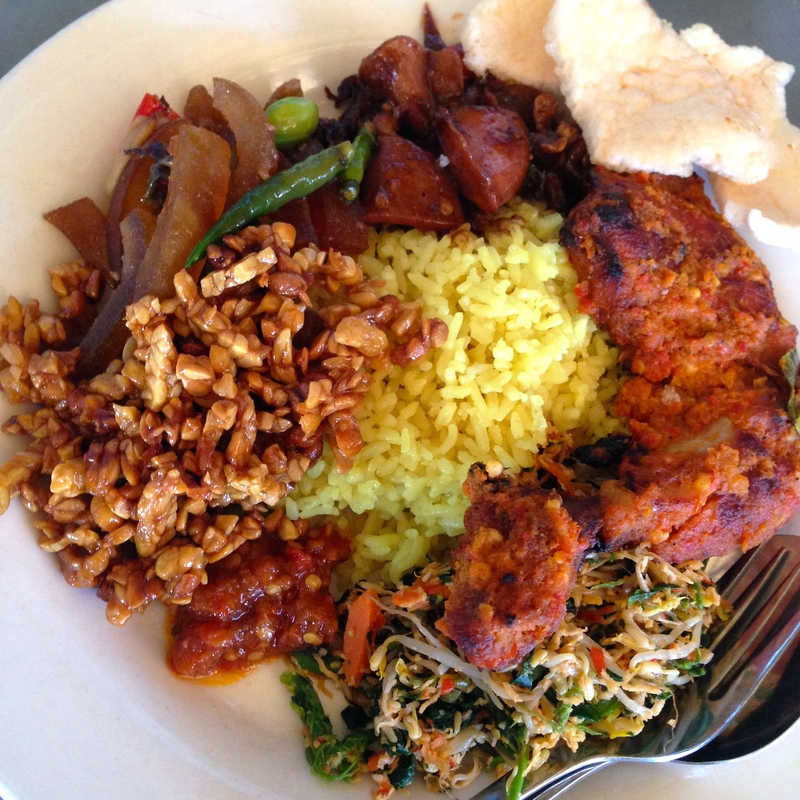 Ubud is famed for bebek (duck). 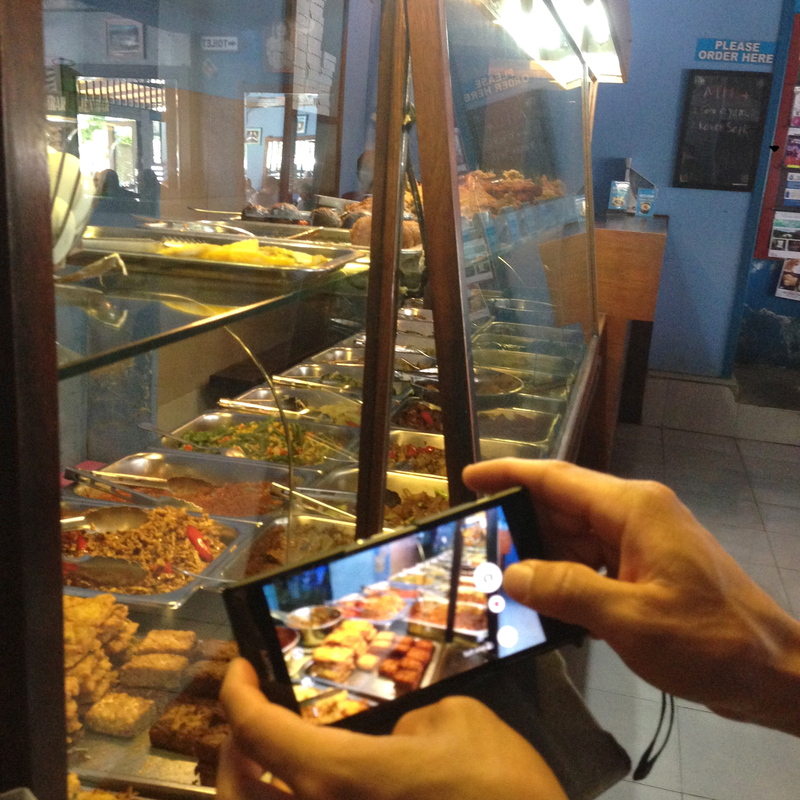 There are two places recommended, one of which is the pioneer of all crispy duck restaurants ;Located next to Coco Supermarket before the turn off to Monkey Forest lies Bebek Bengil literally translated as The Dirty Duck Diner. 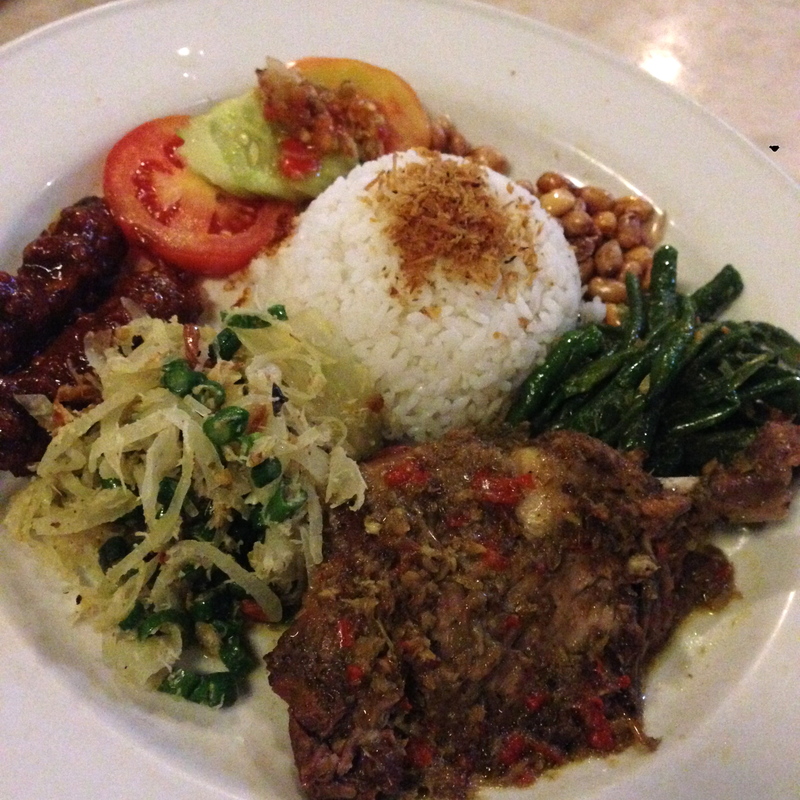 The ever so popular duck is first steamed in Indonesian spices then deep fried for a crispy finish, the dish is served with rice, Balinese vegetable’s and array of sambal, pickles. If you’re up for a bit of spice try opting for the Bebek Sambal, it’s a twist to the original, smothered in tangy sambal with a bit of a chilli punch. Both mains portions half a duck, we opted for the both and had a good split amongst the two of us. The other duck restaurant; Bebek Tepi Sawah (Duck By The Paddy Fields), a little bit further out from the main town center. The name states the ambiance, you’re seated in a restaurant with an outdoor feel with the surrounds of the rice fields, quintessential Ubud. Both premises offers additively crisp duck, though Bebek Bengil requires a day in advance to order Bebek Bertutu (Balinese smoke duck traditionally served only special occasions). 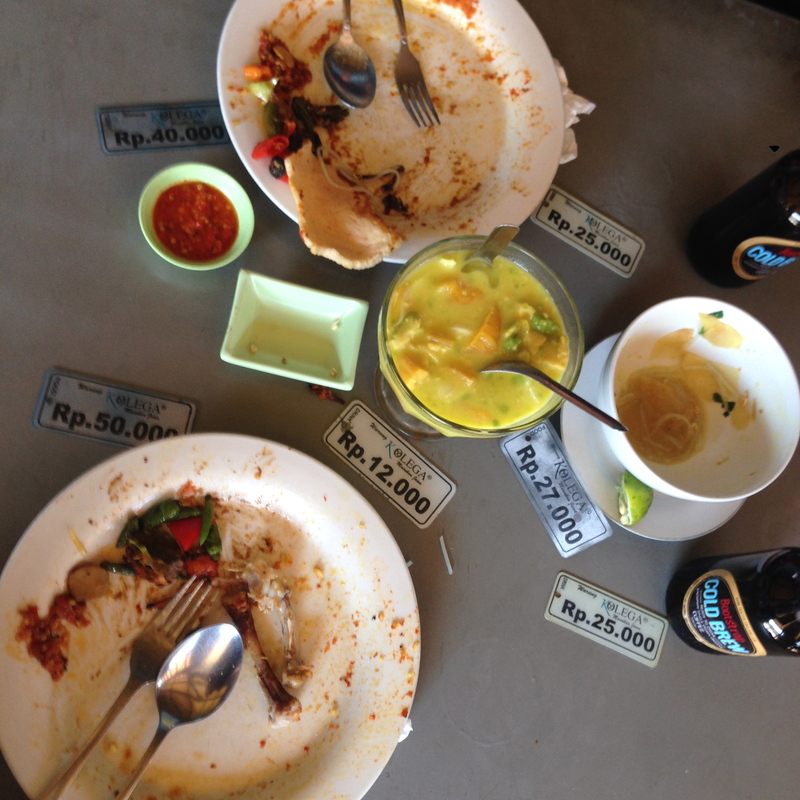 We were beaten in the food game struggled to fit any more duck from Bebek Tepi Sawah. No regrets, I have a premonition that we’ll be back in the near future. Locavore, the restaurant with a passion for crafting contemporary European cuisine from quality local ingredients sourced from farmers, fishermen, and artisans locally around Indonesia. 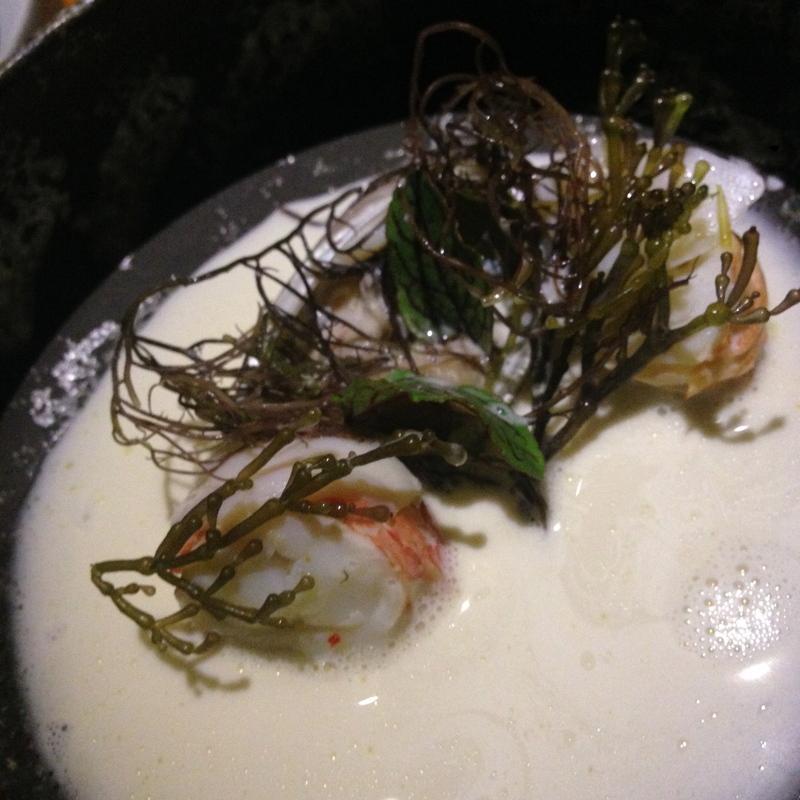 Smoked tiger prawns slow-cooked served with creme of lemon balm covered in a rich pour of bisque crustaces vinaigrette then served with warm crusty sourdough to accompany, appealing? 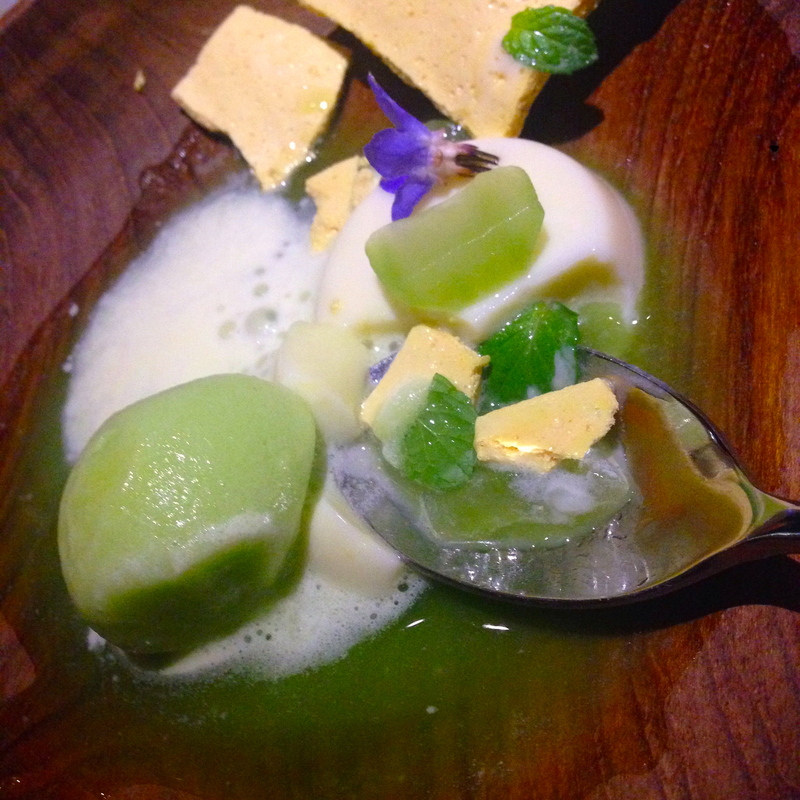 How about a cucumber sorbet served with white chocolate panna cotta infused with dehydrated jasmine flowers, passion fruit foam, pickled cucumber, cucumber juice presented under a borage of flowers? Make room and time for dinner the restaurant offers 5 or 7 course degustation only so a minimum 2hrs set aside is recommended, to avoid disappointment make a booking online in advance. 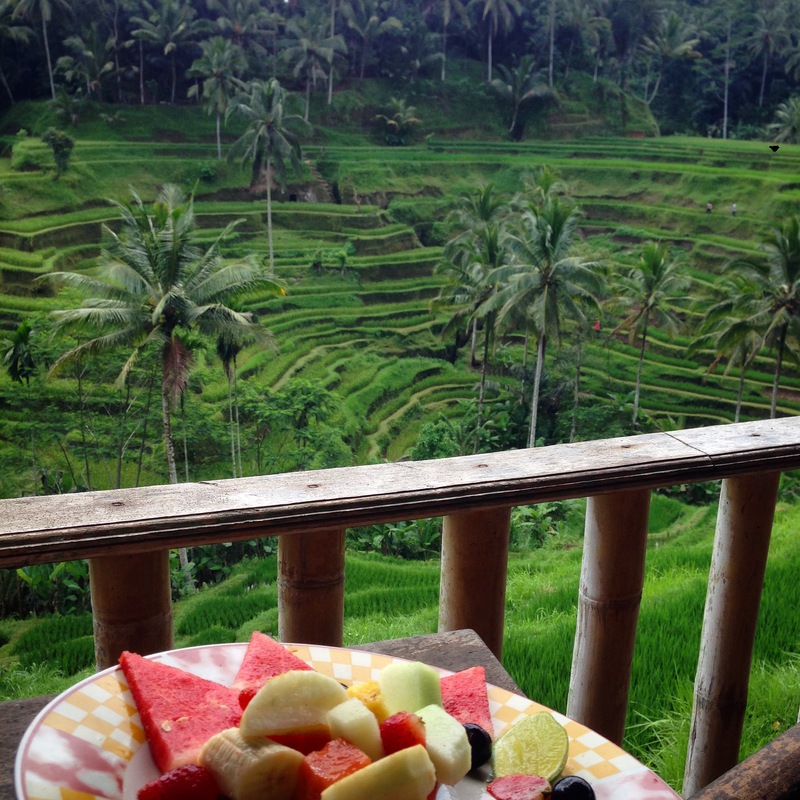 A stone throw away from Ubud is Tegallalang, stop by for a snack while embracing the panoramic view of the Rice Terraces at one of the many cafe’s located around the area. 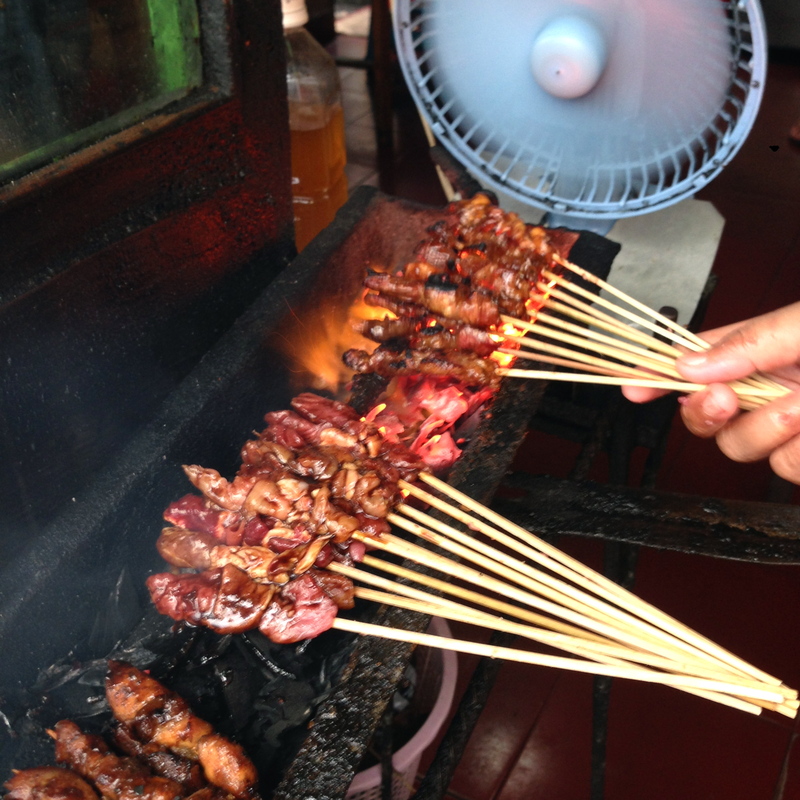 In the heart of Ubud craft market there is a wee satay stall not to be missed. The little warung I can’t recall the name of, offers soto chicken soup, and delicious char grilled satay skewers with mutton or chicken to select from. 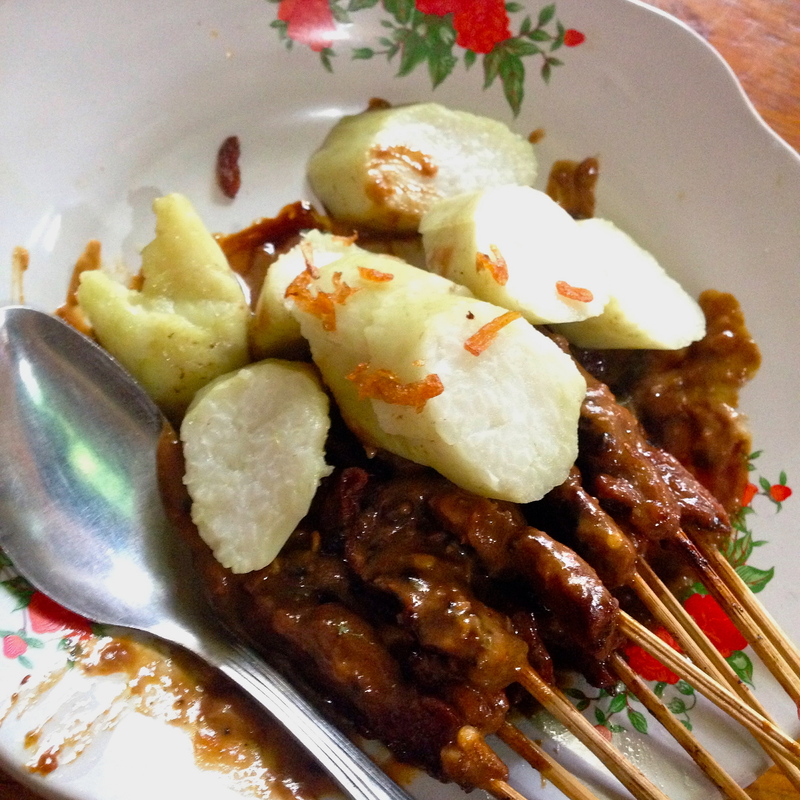 Adrian jumped at the mutton skewers with a side of lontong – glutinous rice cake cooked in banana leaf parcels giving it a special fragrance. 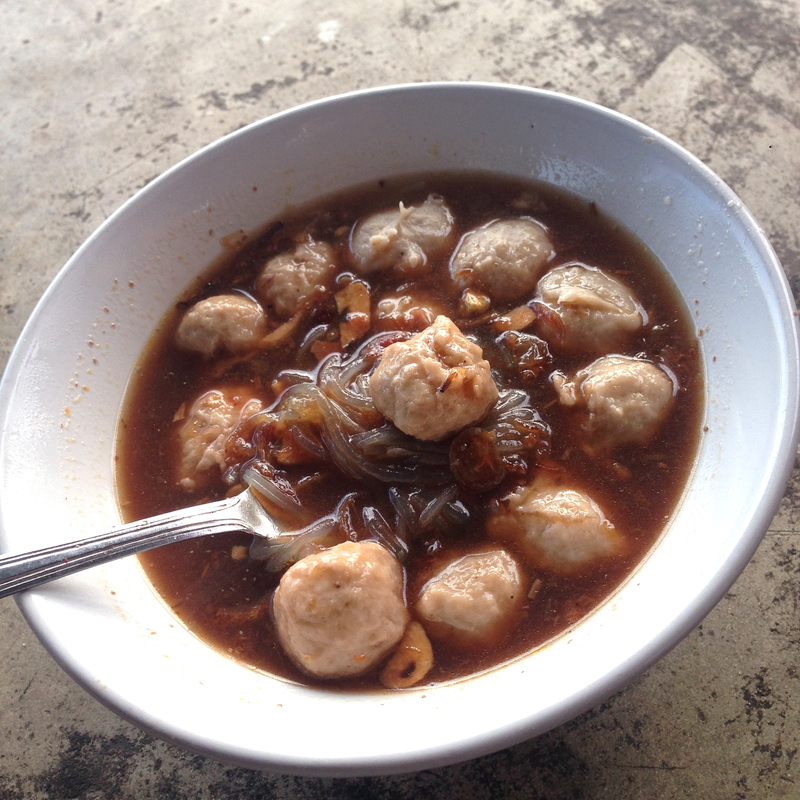 Warung Kolega rates high on my list of places to eat, this Javanese restaurant caters to locals and both foreigners alike. 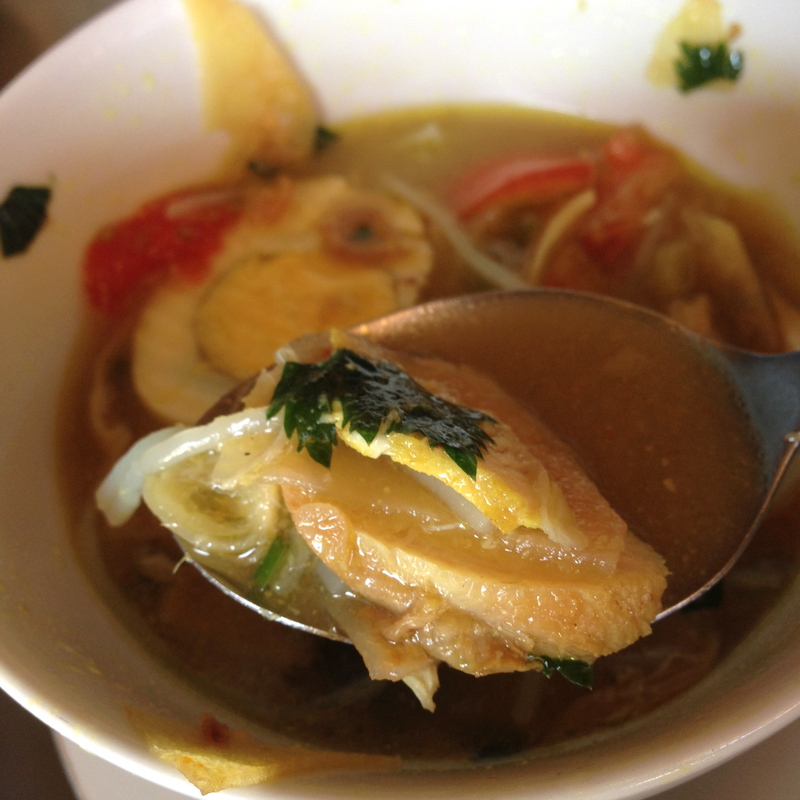 When dining in Warung Koleja everyone hums the same moreish tune, enak! The place needs little description, the quality of food is high in standards, fairly prices, and to top it off there’s a never ending array with descriptions written to select from. I over stuffed and would happily do it all over again. 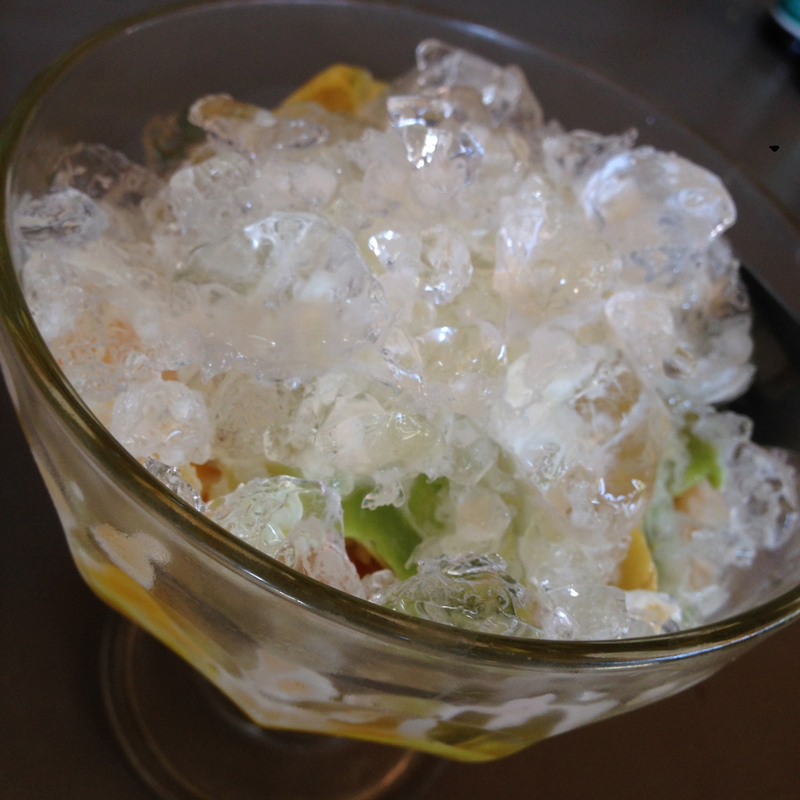 Oh if you some how manage to find to extra space to squish some dessert try Es Teler; icy cold serving of avocado, jackfruit and young coconut to seal. Once again, thank you for the recommendation Mike! 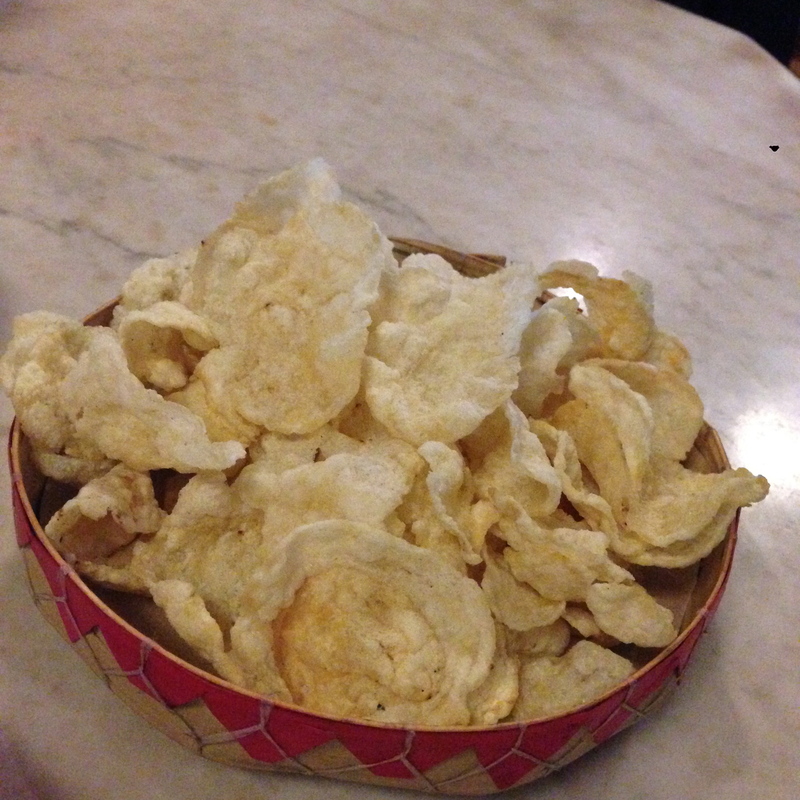 Emping, vegan crackers/chips made of melinjo nut, these have a slightly bitter taste but goes incredibly well with soup and gravy based dishes especially spicy ones. Bebek Bertutu (smoked duck) – Duck rubbed with a mix of Balinese spices then wrapped over layers of betel and banana leaves before being placed over a soft open fire for a minimum of 6hrs to slow cook, results an incredibly aromatic tender duck. 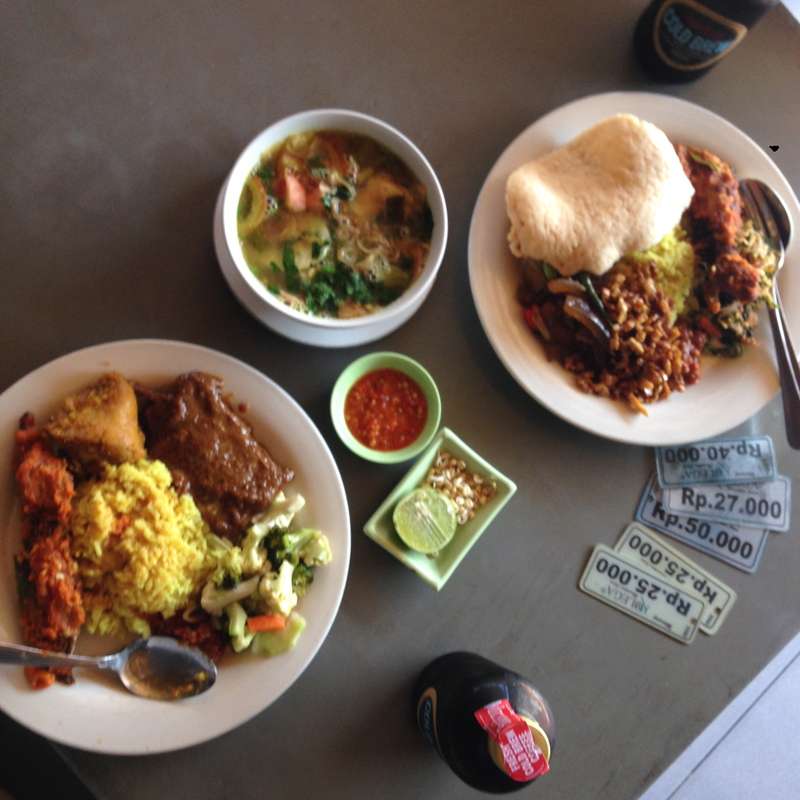 Oka Warung also known as Made Oka Warung, best dinner stop on the island! This gem of a place is tucked away on the corner of the island right before the mangroves forest, the restaurant has the most incredible view facing Mt. 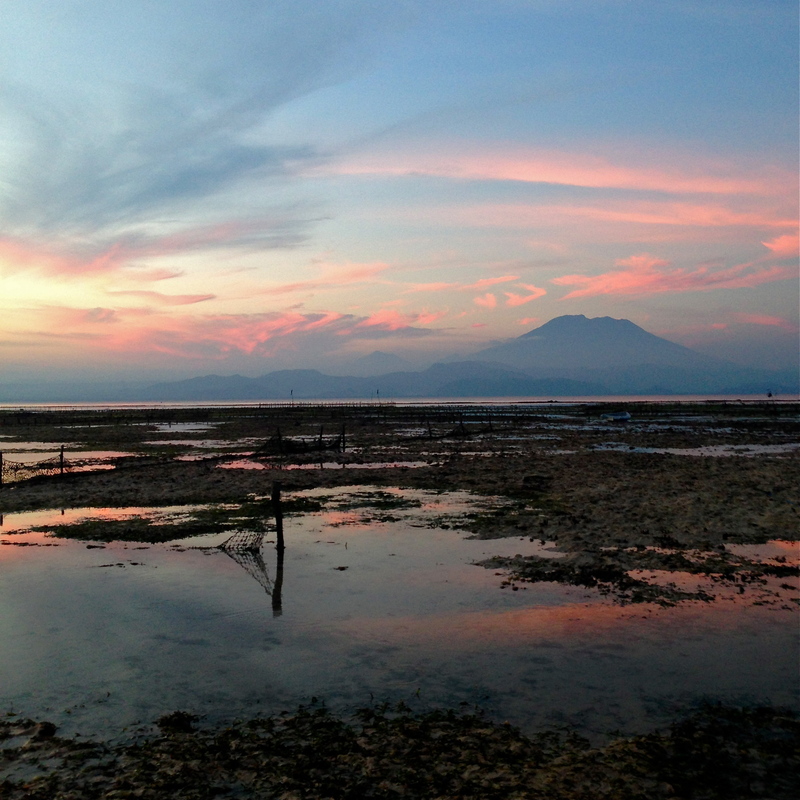 Agung, try get there in time to view the sunset, I promise it’s worth a visit. 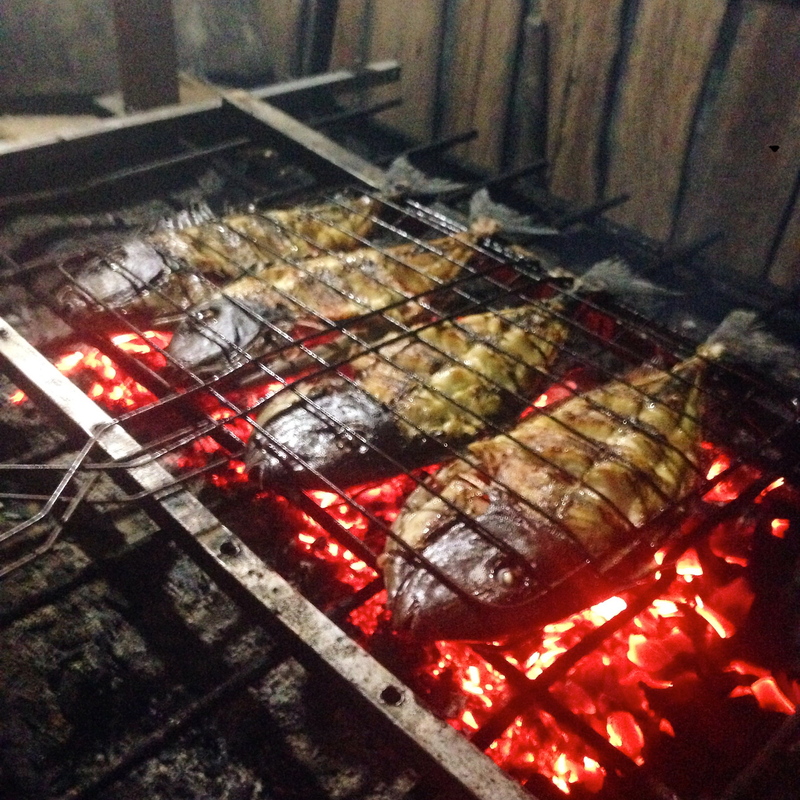 Seafood is incredibly fresh, marinated with a bit of turmeric and garlic then cooked local style over a charcoal barrel. 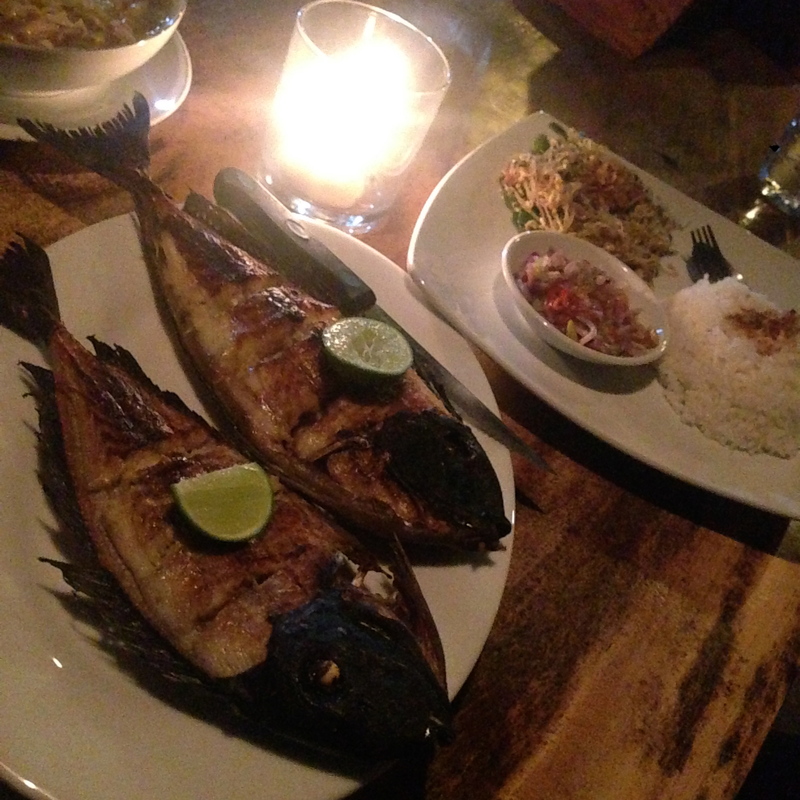 For RP70,000 I scored two jacket fish accompanied with rice and side dishes, the meal is recommended for one but I’m certain it’s plenty for two. 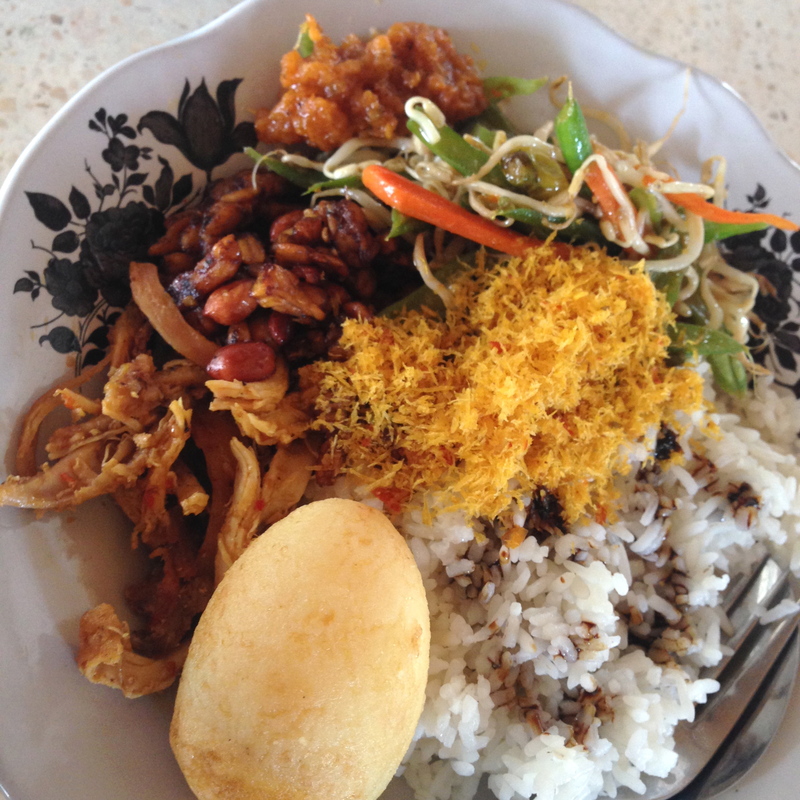 Bali Eco Deli are on the forefront of advocating permaculture and sustainability, they work hard trying to involve local businesses and educating visitors to the island on the importance of recycling and plastic awareness. 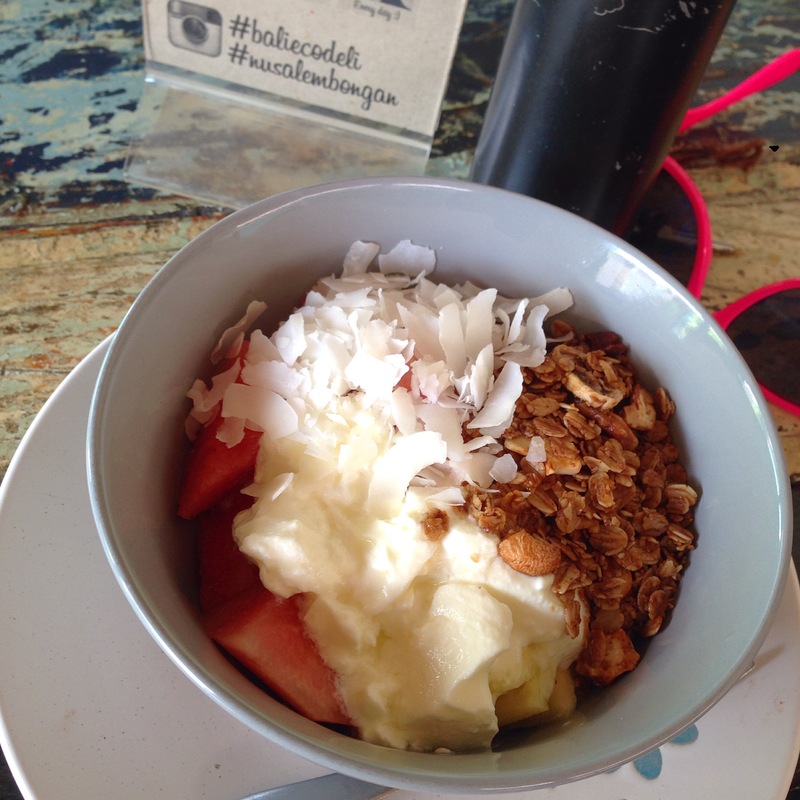 Pop in for one of their delicious smoothies, or guilt free treat. oh! free water refill if you take in your reusable bottle and a small discount to the bill if you bring in plastic to recycle. I love supporting businesses like these. 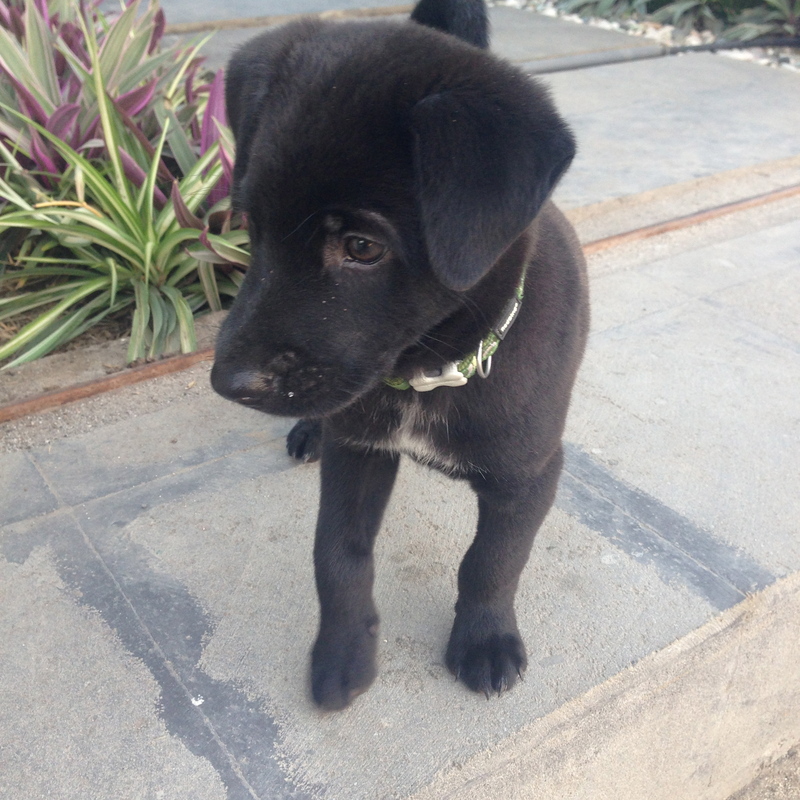 If that’s not enough, they also have a cute pupster Sabtu on standby waiting to play, just look at them eyes *heart melts. 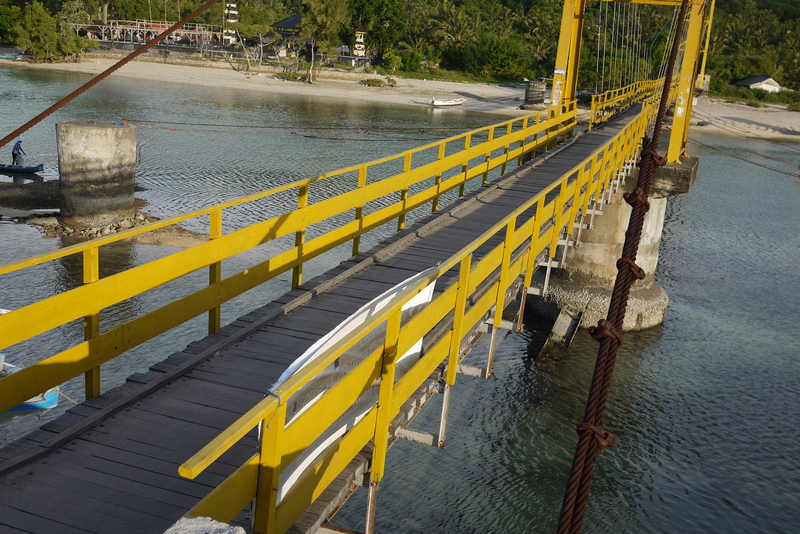 Head towards the Ceningan – Lembongan suspension bridge and you’ll find the friendly Pak Kurma Rubin hanging by his motorbike/stall selling beef ball soto. It’s a great stop by for a quick feed while observing people crossing the bridge on their motorbikes, it can be rather amusing trying to work out what tourist are thinking, a bit of fright in the eyes followed by a huge grin after making it over to the other island and back. I felt the same, phew! 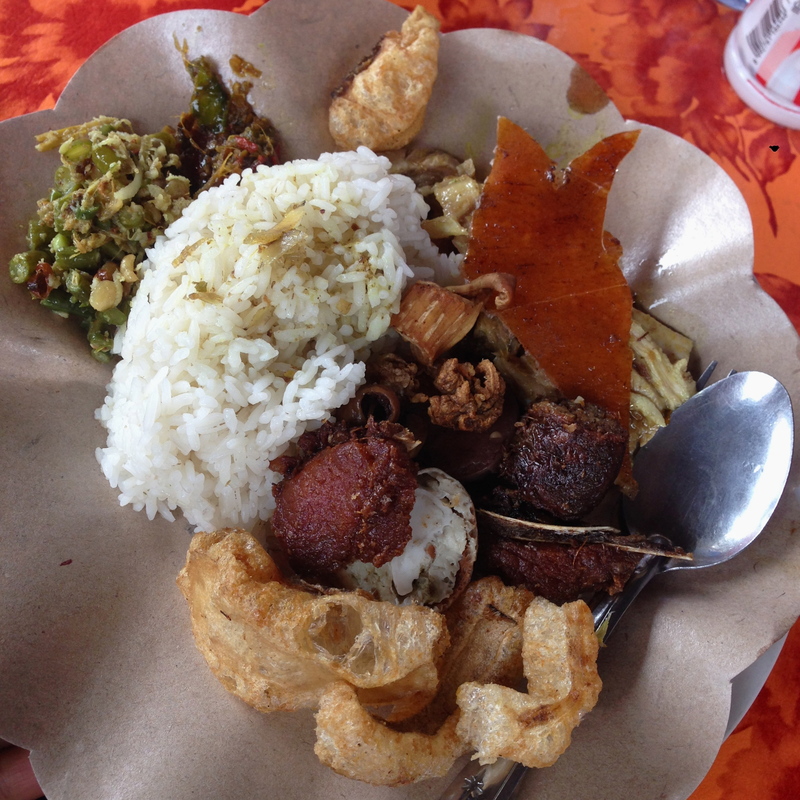 If you’re traveling around on tight budget, nasi campur (rice mix) is a good meal to have when visiting Indonesia, it’s a non specific meal with a staple of rice and a variety of dishes to choose from, typically consisting variations meat, veggies, egg, and tofu. All you’ll need to do is point out what you want, it’s kind of like having subway but an Asian version with rice. 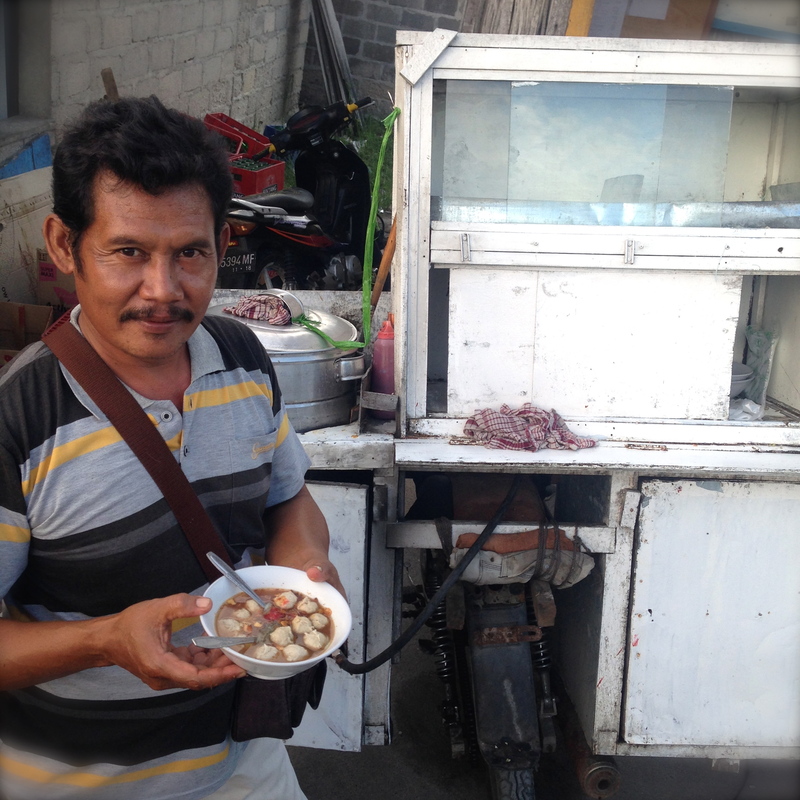 We asked our sopir (driver) Pak Wayang for eatery recommendations emphasizing that we would love to see the places he and his family would go, not where it’s best recommended in booklets (in which case, the places Pak Wayang and most Balinese working class locals would have never tried. The recommended spots would generally be messages relayed from guest and what the locals think tourist would like). 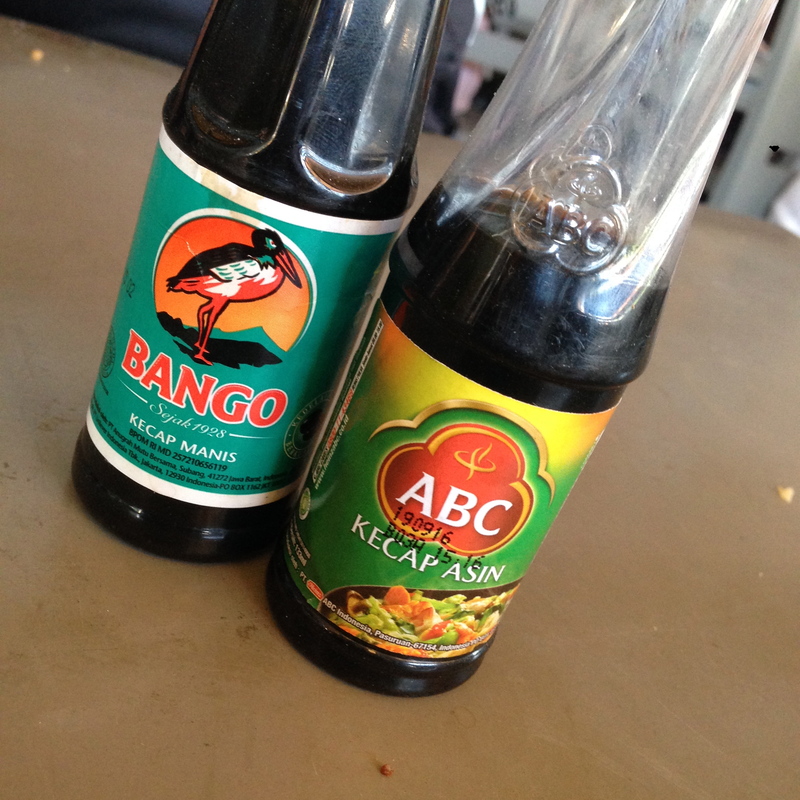 After much dialogue Pak Wayan took us to Pasar Bandung, a place where he and his wife would frequent. At the market you’ll find an array of carts selling Nasi Ayam, Babi Guling, Warung Mie’s and a bunch of other local offerings including tropical fruits, and snacks. We opted for the highly recommended, also the one thing we needed to tick off; Babi Guling, for a very fair price of RP30,000 (about $2.80US) for two plate’s, yes two plates, of the above we couldn’t be happier. Blood sausage isn’t really my thing, and the leathery chew to the skin isn’t really my favourite (I much prefer a western roast or H.K style roast with crunchy crackling) all the other mixture on the plate was spot on otherwise. I was told afterwards that the chew to the skin is just the nature of dish, and we were was not singled out the experience of the crackle from crackling *har! har!. A few handy words to know before visiting Indonesia. Indomie – The quintessential international student fuel, dry instant noodles infused with garlic, sweet soy gravy, and crunchy onion bits, this is made even better when accompanied with an egg, preferably poached. DON’T tell me you’ve never tried Indomie, really please don’t, just smile, quickly buy a pack and enjoy it. 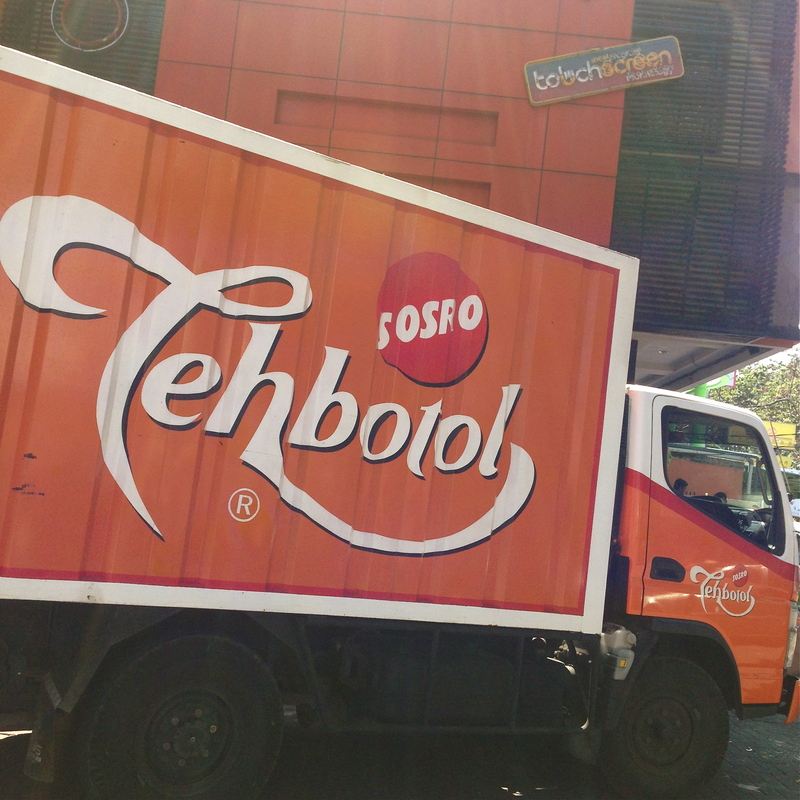 Teh botol – literally means bottled tea in Indonesian. It is a sweetened jasmine tea and it is usually served cold.